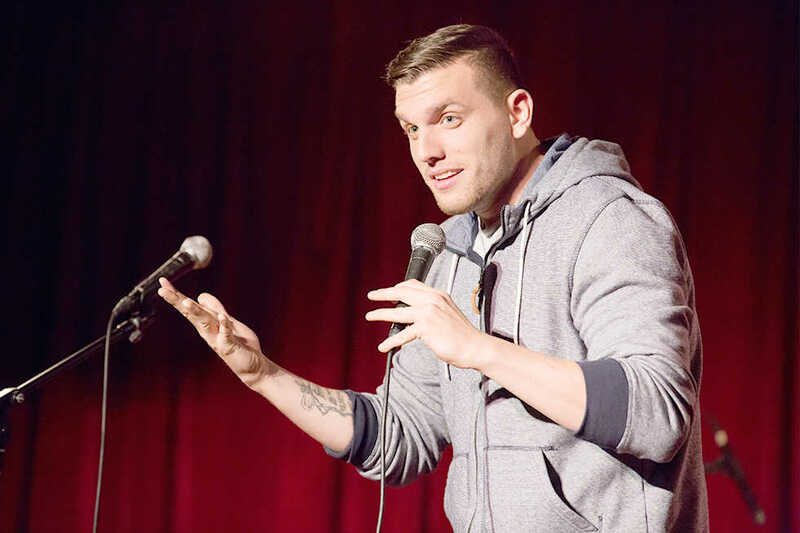 Chris Distefano is an American comic who hails from Brooklyn and got his doctorate in physical therapy from New York Institute of Technology. He made an interesting career leap from being a pediatric physical therapist at a school to becoming a comic — performing stand-up all across the country and signing a three year contract with MTV to star in the show “Guy Code.” His most recent venture is writing his own show, “Distefano,” which CBS picked up to do a pilot. Technique: How does someone go from having a doctorate in physical therapy and being a pediatric physical therapist to pursuing a career in comedy? Distefano: Well, I guess I just took a leap of faith. What happened was I started doing stand-up comedy my last year of physical therapy school in 2009. And then I was doing stand-up every single night. I was doing like 20 shows a week. I basically worked as a physical therapist in the school with the kids from about 7 a.m. to 3 p.m. or 4 p.m. then go hit the open mics from 5 p.m. to sometimes midnight. I’d try to get on any show I could, and sometimes the last show would be at two in the morning and that would be the only spot where a new comedian could get on. Then I would wake up and go to work the next day. So I kept doing that, and then I got on this show on MTV called “Guy Code,” which turned into a real big hit especially amongst college kids. It got to the point where I was on TV a lot. So, that’s what I did. I left, said goodbye to the kids — I keep in touch with them to this day — go back in the summer and visit them and all that — but I jumped two feet in. It took about two weeks, which was crazy. I remember I had about $180 dollars in my bank account. So, I did and then, MTV signed for three years and paid me three times the salary I was making before working at the school. Technique: What is your favorite part about doing stand-up? Distefano: I was an athlete my whole life. I started playing basketball when I was like five years old and played all the way through college. So, that’s what I focused on everyday. Basketball and sports got me excited. Stand-up comedy has basically replaced that in my head. That’s why I’m 40 pounds heavier than when I was playing ball because the newest thing I’m obsessed with is yelling jokes and eating chicken wings at two in the morning. But, it is what it is. I love the adrenaline rush it gives you, and it is very cathartic and therapeutic for me. It’s weird, I have the most anxiety when I’m off stage, but as soon as I get on stage, it is usually the calmest I feel all day. Technique: Congratulations on getting your show “Distefano” picked up by CVS. What were you doing when you found out? Distefano: Well, CBS actually offered us the show right in the room. So, we kind of knew. The announcement came when it came. We already knew, but we couldn’t tell anybody. But when they made the official, official news I was feeding my daughter pudding. It was a good time to like officially know and see it on social media that we got the pilot. Because no matter what happens with the pilot — I mean I hope that I get a show on for 10 years — but even if I don’t, just this opportunity is cool enough. Technique: How is casting for the show going? Distefano: It’s great. We just cast Annie Potts to be my mom, and Diane Guerrero is playing my girlfriend. So we have two great stars on it and are still going through the casting process to fill the other roles. It’s been amazing for me because all of my career has been auditioning, but now I’m on the other side of the camera. I feel like I’m learning a lot about the business, so I’m trying to embrace it as much as I can. Technique: How did you come up with the idea for the show? How long did it take, and where did you draw inspiration from? Distefano: It’s basically based off my real life. I have a baby — a young daughter, she’s almost two now. Her mom is Puerto Rican. She and I met, and she got pregnant right away. So I went from being a single bachelor kind of guy to having a step son, which she had from a previous relationship, my own daughter and a new girlfriend. We had only known each other for about 10 months before the baby was born because that’s how fast all of it went. So, it was crazy to say the least. At the time, I was doing stand-up. All my stand-up is about my life — I try to stay autobiographical with it. The guys who created “How I Met Your Mother,” Craig Thomas and Carter Bayes, saw me and told me that they thought there was a show here. So, I’d go to their office a couple of times a week for a few weeks. I would just talk about my life and tell my story. Those guys are just amazing at creating TV shows, so they created a pilot episode about me. It covers being married to a Puerto Rican girl, having a baby right away, having a stepson, merging the Latino and Italian cultures and trying to get to know someone while you are raising a newborn baby that you have with that person. Technique: How does your family feel about being portrayed on television? Distefano: They’re cool with it. Yeah, they’re portrayed on it, but it’s TV, so it’s also like an embellished version. And it’s not just me and my family: the other writers also bring their experiences to the table. So, we’re just using the relationships and loosely basing characters on them. It’s not like a reality show. Nobody would ever know anybody’s real name or actual real story. So, they’re cool with it. They just want me to succeed and hopefully get this show on the air. Technique: What is it like to work with Carter Bayes and Craig Thomas? Distefano: They are legends. They created “How I Met Your Mother,” an epic show that went on for nine seasons. They are the coolest guys to work with. I can do stand up, that’s one thing. I can write all my own jokes and come up with all that stuff, but to write a TV show is a completely different muscle and a completely different set of skills that those guys are amazing at. We’re trying to combine what I can do with what they can do and create a great show. challenge catering to this new audience? Distefano: MTV is for more high school and college kids, so I’m not going to talk to them about being a parent and doing my taxes. Because that’s not relatable. I’ll tell them what it was like when I was their age and funny things I used to do. I would try to lower my maturity a little, but still say smart things because you know, a lot of these kids are really smart kids. A lot of them have never even been to a comedy show before, so they don’t even really know what to expect, whereas CBS is a bit of an older audience where I feel like I can talk about what is going on in my life right now. Teenagers don’t care that I need to take three fish-oil pills to stay heart healthy, you know? So, I get to talk about what is going on in my life right now for CBS, whereas with MTV I talked about what happened to me. I’m more present with CBS. Technique: What is the most unique quality about your show that will make it a success? Distefano: I think a mixing of cultures — a Latina woman and white guy — being on a sitcom as young parents hasn’t been done. And not just mixing our cultures, but seeing if we’re even going to make it because we had the baby right away without even knowing each other. Now, we have to be forced to try and make this thing work and seeing if that’s going to happen or not is hopefully what keeps the viewer interested. And falling in love with our story and seeing how it all ends and works out. Because it is hard when you just know someone for a month and, you don’t know, there could be major red flags about that person that would have you running for the hills if you didn’t have a kid. But you do have a kid, so you have to figure out ways to get around the wall. So, that’s what I’m hoping makes it stand out and feel different. Technique: You are very accomplished in terms of academia and comedy. So, what’s your next goal? What’s next on the plate? Distefano: My immediate goal is to get this show on the air and have the show be successful. But I ultimately want to get to a place where I can have my daughter play sports, maybe like soccer or basketball or whatever she wants to play, and be her coach. That is what I want to do.